Seminole Trombone Quartet — Davis Ellis, Dunwoody Mirvil, Stephen Ivany and Christopher Brown — will play at Carnegie Hall May 6. The Seminole Trombone Quartet is about to take a bite out of the Big Apple. 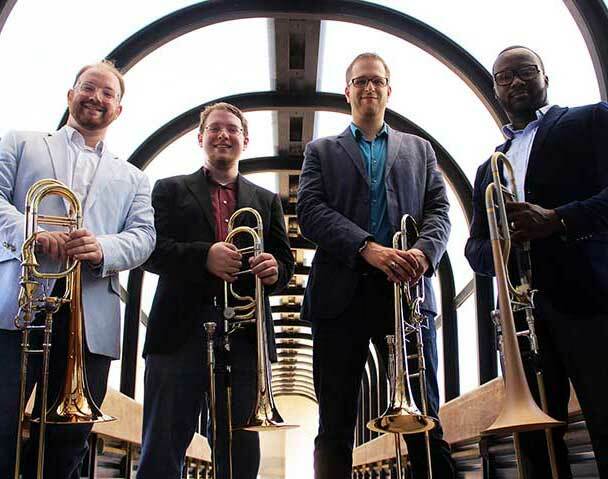 Florida State University College of Music doctoral students Dunwoody Mirvil, David Ellis, Stephen Ivany and Christopher Brown — also known as the Seminole Trombone Quartet — have been selected to perform at the prestigious Carnegie Hall as a part of the “Noles in NYC” event Friday, May 6. The Seminole Trombone Quartet — or STQ — earned the honor through a competitive process that was open to all students in the College of Music. Groups not only had to give a quality performance, they also had to put together a proposal for marketing the recital with a $2,000 budget. An entrepreneurship panel chose the winner. “You had to be one of the best musical groups, but you had to be the best thought out budget-wise in terms of how we were going to fill the seats,” Ivany said. STQ’s debut performance at Carnegie Hall will feature the best of trombone quartet literature as well as a new commission for a trombone quartet by New York City composer Sheila Silver. The group has been gearing up for the gig of a lifetime over the past few months with a Carnegie Hall Preview Tour at universities throughout the Southeast. STQ will present a sneak peek of their program for Florida State and Tallahassee audiences before it departs for New York with a recital at 8 p.m. Thursday, April 28, at Longmire Recital Hall, Room 201 Longmire Building. The event is free and open to the public. This is primed to be a big year for STQ. The four FSU trombone teaching assistants also have been invited to be headline performers and present a lecture at the Midwest Clinic International Band, Orchestra and Music Conference in Chicago in December. More than 17,000 people from across the world attend the event, which displays top ensembles to showcase the newest ideas and talent. For tickets to the Carnegie Hall recital, visit carnegiehall.org or call (212) 247-7800. Tickets are $10 general admission and $8 for students, seniors and alumni.